The ingredients in this soup change week to week but the technique is generally the same. The possibilities are literally endless. In place of barley, you can substitute lentils, Israeli cous cous, tubetti pasta, baby shells or macaroni. Onions can be substituted for leeks or shallots. You can use practically whatever vegetables are in season, and even add beef, chicken or baby meatballs. The general technique for all these soups is as follows. Start with a heavy bottom soup pot, I personally love my cast iron. Add some olive oil and sauté some carrots, celery and onions. Once those soften, add any dry herbs like herbs de provence, dried sage or bay leaves and then your broth. Bring to a soft boil to build flavor to your broth and then add your parmesan rind and remaining vegetables minus the fresh herbs and leafy greens. Once your veggies are cooked to your satisfaction, add your cooked grains or pasta in increments. Pre-cooked meat can go in at this time as well. 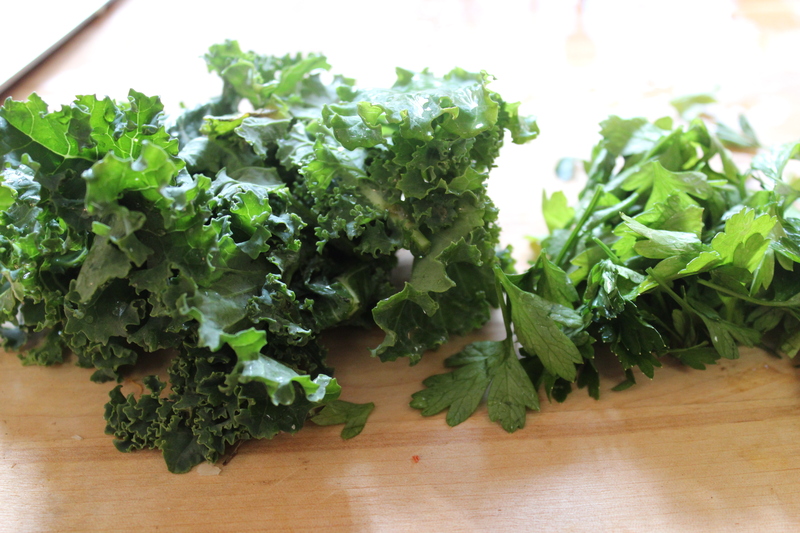 Once your soup has been brought back up to a boil, add your greens and fresh herbs. Done! Size matters when it comes to making soups. Not only do you want your vegetables to cook evenly compared with one another, i.e. you don’t want hard hunks of potatoes next to mushy carrots, but you also want perfect bite-sized pieces that allow you to taste the unique flavor of each ingredient. 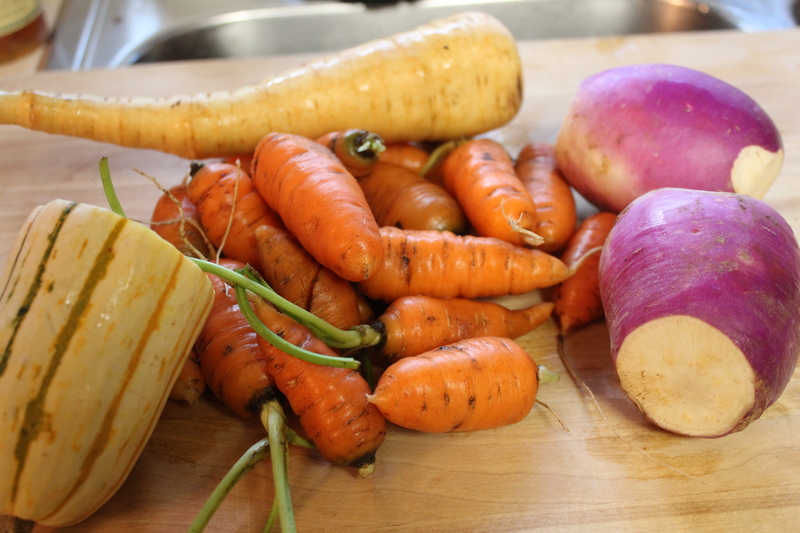 Try to keep your root vegetables generally the same size and ensure that they will all be done at the same time by timing when they go into the soup. As a rule of thumb, carrots take a bit longer and hold up better than potatoes. Squash, like delicata, butternut and acorn, while seemingly hard will cook rather quickly once brought to a boil. Zucchini literally takes less than minute. 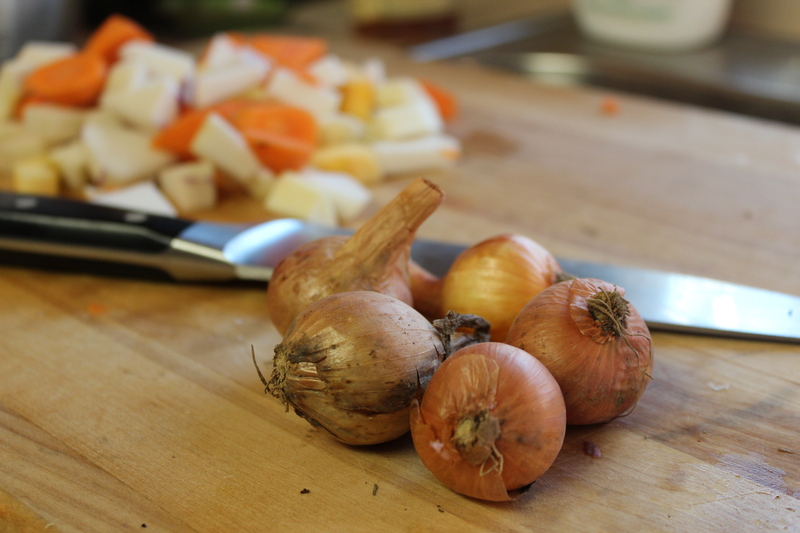 Many of the soups I make start with a basic trio of carrots, celery and onions. If I’m not making a vegetable focused soup, then I’ll cut these extremely small so they virtually disappear into the background. This trio will add loads of flavor to your broth. If I want carrots to be a centerpiece of the soup, then I’ll reserve some larger slices to add later. Parmesan rind and cheese are an incredible flavor enhancer to soups. I try to always keep some in my fridge and noticed just the other day that even our local massive supermarket chain had some reserved in the cheese section. One thing to make sure of is that you’re using the real thing. I once added the rind of some other parmesan-esque cheese that seemed like a decent alternative only to be left with a waxy, synthetic tasting broth. The whole soup had to be tossed. Cook your grains and pasta separately and add them once the soup is almost cooked. I personally like my soups so thick that they truthfully cease to be soup at all. It’s actually running joke in our house when there’s visibly broth in our bowls…”wow, you actually made soup this time!” The problem with adding uncooked grains and pasta is that they soak up so much liquid that unless you’ve measured exactly what you’ll need you almost inevitably end up with too much. Grains and pasta also add to the cooking time while contributing almost nothing to the flavor of the soup and can make it difficult to calculate cooking times your vegetables and other ingredients. I like to add my grains and pasta in increments, stirring to make sure I like the consistency and adding as needed. If you’re running low on broth, it’s also nice to have some reserved starchy, salty liquid from the cooked grains to add instead of water. Start by cooking your grains. Rinse your barley, place in a medium-sized pot and cover with plenty of water, at least 5 cups. Add a good pinch of kosher salt, cover and bring to a boil on the stove. After 20 minutes, begin to check for doneness. Once cooked, strain out remaining water and reserve for adding to your soup. Place a heavy bottom soup pot on medium high heat and add about 1 tablespoon of olive oil. After a minute or two, add your diced onions, celery and carrots. Sauté for a few minutes until soft, try to avoid letter the veggies brown. If you see that they are starting to brown, turn down your heat, stir several times. Add 1 quart of chicken broth equivalent to 1 carton plus 1 cup of water. 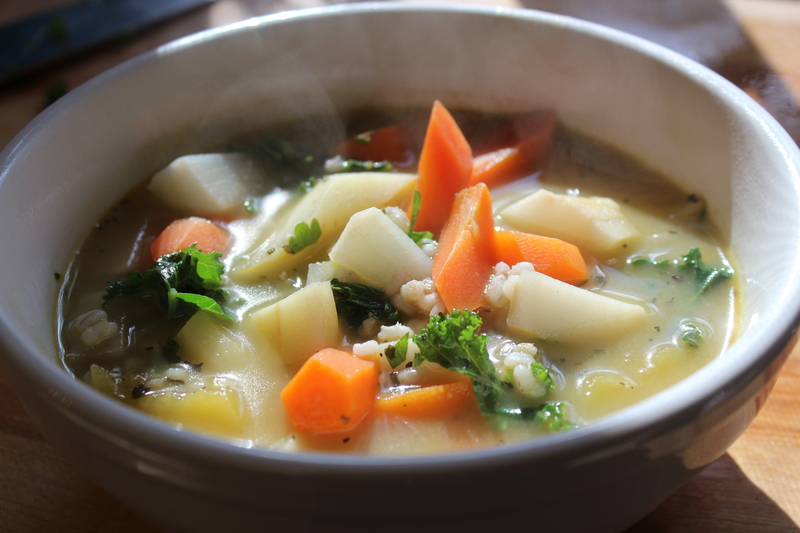 Bring broth to a boil and then add your parmesan rind, followed by the squash, turnips and parsnip. Turn down the heat to medium, stir and cover for about 5-8 minutes. Once the soup has returned to a boil, check intermittently for the doneness of the vegetables. 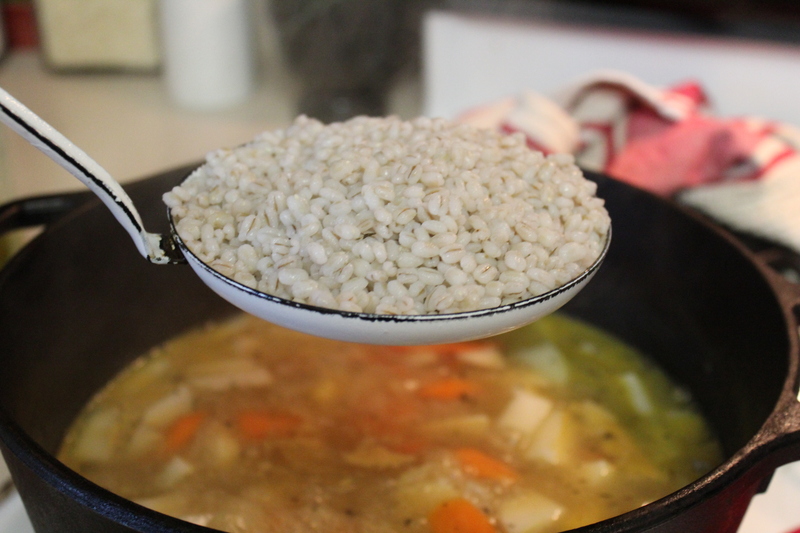 Once the vegetables are cooked to your likeness, begin to add your barley in large spoonfuls, about a 1/2 cup at a time. After each addition, stir and check for thickness. I added about 3/4 of my cooked barley to my soup but I tend to like my soups thick. Once the barley is stirred in, bring the soup back to soft boil and add your kale and parsley. Stir and allow the greens to wilt. Remove from the heat. Finish your soup with as much freshly grated parmesan as you prefer. At this point you can also fish out the parmesan rind, which should be very gooey and mostly disappeared. I like to grate my parmesan with a microplane so the cheese disappears almost immediately into the broth. Serve with freshly ground pepper and salt to taste.